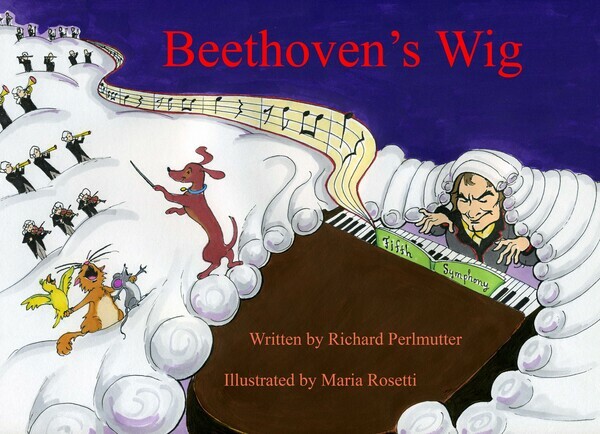 Bonus CD included with three songs, Beethoven's Wig, Beep Beep Beep and Minuet For My Pet, and three classical pieces by Beethoven - 5th Symphony, Moonlight Sonata and Minuet in G.
In the first Beethoven's Wig picture book for children, Perlmutter's lyrics to Beethoven's 5th Symphony are illustrated by artist Maria Rosetti. Each picture captures a moment in the song, which describes Beethoven's gigantic, titanic, monumental and colossal wig. In the book, Beethoven's pet dog, cat, bird, and a little mouse follow the great composer and his wig through city and country, out to sea and into outer space. The animals enjoy skiing, boating and surfing, and help shampoo and "mow" the wig after Beethoven is refused service at the barber shop of Vidal Bassoon. It all ends happily at the concert hall when all the musicians pop out of the wig to play! Throughout the book, Perlmutter's lyrics and the actual notes to the Fifth Symphony are music woven into the illustrations. When Beethoven's dog walks along the music staff its paw prints become notes. And when Beethoven's fish commandeers a submarine and his cat goes scuba diving, little fish in the ocean become notes too. If you can read music, you can actually play right along as you sing the tune of the song "Beethoven's Wig!" There is a bonus CD with the book that contains three Beethoven's Wig songs. Two are among the group's best-loved songs, "Beethoven's Wig," and "Beep Beep Beep." The third, which is only available with the book, is the hilarious "Minuet For My Pet," a tender homage to a dancing horse, set to Beethoven's famous "Minuet in G." The CD also includes three classical pieces by Beethoven without lyrics – "5th Symphony," "Moonlight Sonata," and "Minuet in G."
The Midwest Book Review said, "An excellent introduction to the fun of classical music for children. Inventive and beautifully illustrated "Beethoven's Wig" is a beautiful addition to your library."